Between service providers such as Comcast, Verizon FiOS, Time Warner, AT&T, and Mediacom, there are a number of cable subscriptions out there for businesses to take advantage of; each with their own perks, packages, and reasons for choosing them over a telephone company TV solution. So how do you choose? Most people go for what’s cheapest, but even if you start with the cheapest, the rates rise quick. Is Cable TV Best for Business? In short, NO. 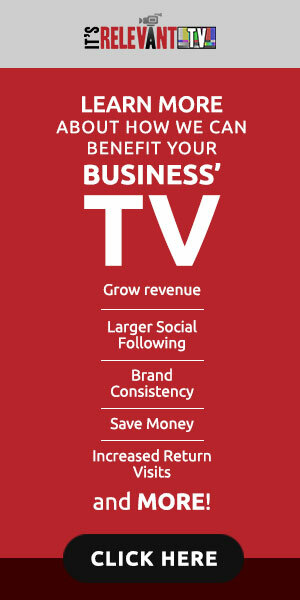 Depending on the type of business, the TV may be used for a number of different reasons. More often than not, a TV is in place for to offer visitors a comfortable distraction. Something to take their minds off of waiting. But in the end it all comes down to customer satisfaction. A satisfied customer and a better experience helps ensure future visits and more business. It’s Relevant TV is a service that transforms televisions into tools that improve customer experience, and helps generate more revenue for your business. IRTV is a unique waiting room TV software that replaces cable television with short-form videos that streams directly from a vast library of content. Content that is family-friendly, arranged into categories to choose form based on the interests of visitors, and licensed for display in public. It’s Relevant airs alongside your own original content, personal ads, or highlights you want people to see. The ability to showcase additional services, deals, and ongoing specials while visitors are watching the TV gives you a unique opportunity to inform them of things they might not have been aware of, which they’ll then come back for later. Unlike cable, It’s Relevant TV is designed with businesses in mind. Cable is a flat expense, it’s a service that you pay for without any real return – whereas It’s Relevant TV represents a noticable ROI in the way of educating visitors on additional services. It’s all about getting people to come back more, and spend more – all the while creating a better experience. Business ads are a great tool for, what else? Improving business. However having business ads is only half of the game. In order to get your time and money’s worth out of those ads, you need a platform for them to run on – you needs TVs. TVs let us get messaging across better, and faster than anything else out there – and it’s as simple as putting TVs up in public places and selling ads. This article will highlight a few things to consider when creating a business ad network. Think of all the places you see ads these days. TV, radio stations, highways, on buses and billboards, in newspapers – even in front of YouTube videos. They’re everywhere. Leveraging ads in businesses is the fast-track to becoming reaching customers. Showcasing your ads inside a business gets visitors exposed to your brand, and more importantly, educates them on services they might not have been aware existed – services they’ll come back and take advantage of. It’s a win-win, and a great way to market your business. If you’re serious about building a business ad network, you need more than just ads for it to be effective. A signage system that loops the same ads again and again is no good, and could be harmful for your message. You need to pace it with content in between ads; doing so will make it look, and feel, like a real live television network. But you need content to do this, and licensing content is expensive. Fortunately, there’s a solution. It’s Relevant TV brings the best in digital TV signage and waiting room TV software. With a network library of over half a million videos, your business ads can be uploaded and played alongside fun, and interesting content. IRTV’s videos are split into 40+ categories you pick and choose from – everything is fully customizable, and can be controlled through a digital signage app on your phone. From anywhere. Plain as day – if no one is looking at the TV, no one can absorb your ad message. It’s Relevant gets visitors to look at the TV by mixing programming with your ads. When you combine those ads with IRTV’s content, you create a living network tailored to your business. One that’s designed to get people to come back more, and spend more. Visit itsrelevant.com, and explore building your own television ad network.